Need a blanket in a hurry? I managed to crochet a snuggly throw in less than 10 days. I'm sure it happens to all crafters at some stage–the need for a handcrafted item at short notice. This happened to me recently ("…But Wait … There's More!"). It amazes me that, after 10 years of crochet , I am still learning new things even with the simplest of projects. Day 1: 2¼ stripes completed. Off I went in search of a warm, super-chunky yarn for my elderly relative whose toes were freezing despite being wrapped in multiple hospital blankets. Hospital blankets are not that warm. They are made from cotton for easy laundering and sterilising but cotton is not as warm as wool or other fibres. Cotton can be very heavy so the blankets are a very thin open weave to keep them light but the thin weave does not lend itself to warmth at all! 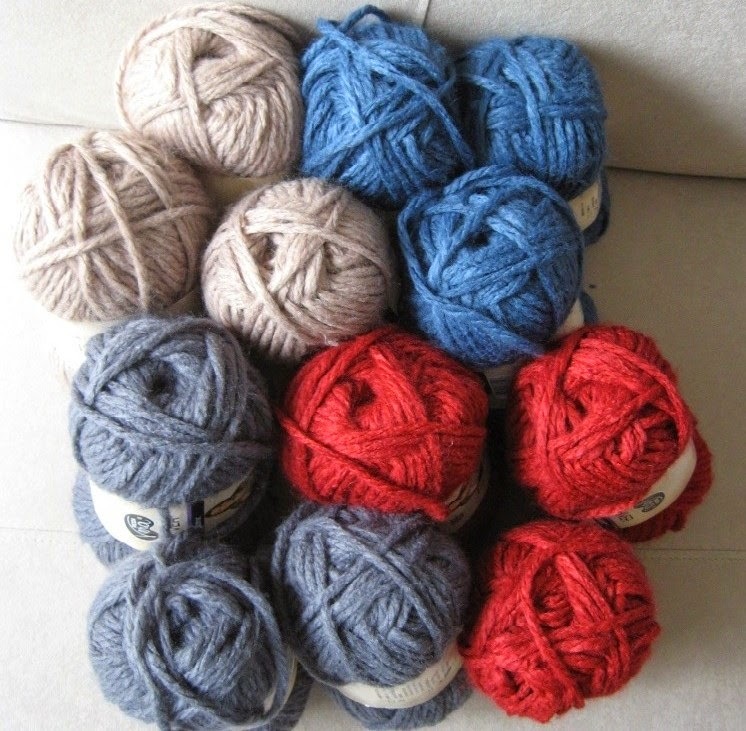 For my blanket, I wanted a wool-acrylic blend–wool for warmth; acrylic to keep it light, easy to wash and quick to dry. Unfortunately, my local shop had little variety with the only suitable choice a 100% acrylic, Moda Vera "Shiver". Moda Vera "Shiver" is a super-chunky, 100% acrylic, loosely plied yarn. It feels light, soft, 'squishy' and warm. like this to get an idea of the final outcome's colour balance. The colour range was limited (out of season at the moment) but I was pleased to find colours that I had in mind–blues, greys and beiges to match the home decor for use at home after hospital, plus an accent colour that would be harmonious but also acceptable to the recipient. The recipient often wears red in his knitwear. I like the warmth of red against the cooler blues and greys, and its depth of colour against the neutral camel. Day 4: 8 stripes (16 rows) completed. The original Shaded Ripple Afghan pattern used four colours (as did mine) but before embarking on the crochet, I reached for the coloured pencils to get an idea of the finished look. I didn't want to work a significant amount of the blanket only to discover that the combination doesn't really work and needs to be ripped back! I was happy with the chosen colour palette but didn't like the look of the stripes when worked according to the suggested order of the pattern. Out came the pencils again to experiment with swapping colours A, B, C or D. Sadly, I wasn't very satisfied with any of the arrangements. Experimenting with the order of coloured stripes. The only thing for it was to abandon the suggested stripe order and work something out by myself, specifically for my colours. Seventeen stripes allow for symmetry between centre and edges. I wanted grey on each end so that it wouldn't show up the dirt easily because frequent use can leave the edges of blankets and quilts looking shabby and the edges are usually the first parts to become worn. I wanted the blanket to have a bit of symmetry and order, but also to disturb the symmetry in places to keep the colour combination dynamic and interesting. When I am sick and cannot do anything but lie there, it is good to have something of interest to observe. If anyone chose to examine the blanket to look for a pattern, I wanted to provide some intrigue. I also wanted a greater percentage of the light camel colour in order to balance the mix of darker colours. "How many more hours are you going to stare at those colours?" (almost on cue) a pleasing combination appeared! A pleasing combination of cut-out stripes. You can also see my stitch diagram for comparing this ripple pattern with others. My daughter gave me a disbelieving grimace when I rebuked her with the news, "I've just found it!" and then gave her a lecture about the importance of planning. Now that I knew what I was doing, I was set. As if I had heard a starter's gun, I was off! With my 10 mm bamboo hook in hand and crochet certainty in my head, the blanket grew very quickly. Day 6: 13¾ stripes completed. Lightweight but sturdy–to offset the eventual heaviness of a blanket, and easy to hold. In-line head–for ease of pulling through loops without getting snagged. A loosely plied yarn such as Shiver is more inclined to split and get caught. Because the head of the hook is no wider than the handle, the hook will slide out of a loop as easily as it went in. This reduces delays from getting the hook caught and is less stress on the wrist by not having to twist the hook so much on the way through each stitch. Natural material–bamboo is warm compared to metal hooks and a nicer texture and less sweaty than plastic. I find this kinder to my hands, especially with my MCTD*. Even the type of stitch marker can make a difference. I had fallen in love with these locking pin stitch markers–secure but also thin enough and smooth enough to get through tight spaces without splitting stitches or yarn. That's okay for most yarn weights but these markers were too small for super-chunky acrylic. I had difficulty opening them wide enough to get around the strands without splitting them. Not only that, but the locking pins themselves were too small to keep the work from unravelling. The old split ring markers were perfect for this super-chunky yarn. I used the largest of two sizes. These markers were large enough to accommodate the strands without splitting them, and also to secure the work properly. pink locking pin on the left and red split ring on the right. Stitch markers are useful for securing your stitches and marking out your pattern to avoid mistakes. 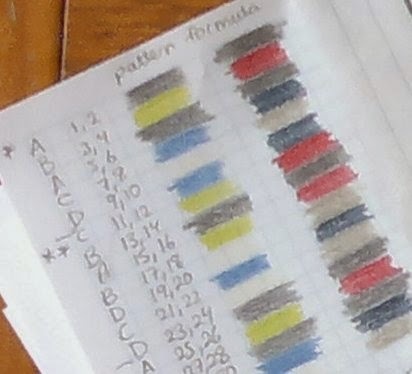 I marked the first and last stitches of every row for ease of counting. This ripple blanket had a relatively short pattern repeat. 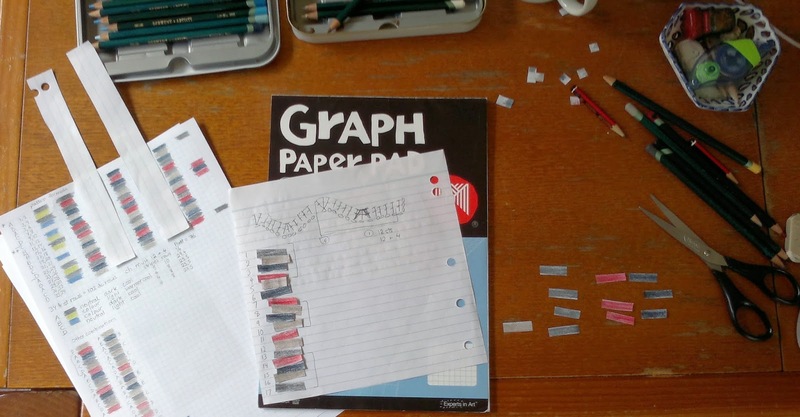 With longer repeats and when learning to do ripple patterns for the first time, it is helpful to mark the centre stitch of each hill and valley. The blanket soon grew too big for the project bag. A big old blue plastic crate was rescued from the shed and thoroughly scrubbed clean to become a clean, tidy home for blanket and yarn. It was so convenient to be able to toss everything into it at the end of the day, knowing it would be kept clean but it was also handy to have next to the sofa, ready to just pick up and put down at a moment's notice. and ready to wash and block. On the ninth day, the blanket was complete. I usually damp block my projects but I decided to hand wash this one. I wanted it to be super soft and thoroughly clean with no trace of sizing or any other impurities on it before giving it to my relative in hospital. It took much longer to dry even though it is summer time and the blocking board was placed right under a fan. Despite the extra drying time, it was well worth the wait for great results. Compare the unblocked blanket (above) with the blocked one (below) and see how the blocking process evens out and defines the ripples. all dry and all done, ready to give. I'm afraid I don't have another photo of the finished, blocked blanket because I was in such a hurry to deliver it that I dashed off to the hospital without another thought! Do you have any tips or tales about speedy blankets? 100 grams / 85 metres per skein. looks wonderful. I am making a sockyarn blanket - definitely not speedy - I am half way after a year! (or course there are lots of other projects that have gone on and off the needles in that time...but still I am very impressed with the colours and the pattern of your blanket. Planning paid off big time! I will have to invest in some bamboo hooks as I really don't like the plastic ones. I've used those locking stitch markers and found that they break very easily. Your finished blanket is really lovely. Love how the blanket turned out! It ripples pop your nicely with the thick yarn! Ahhhh(said with a pleased sigh). and once again I'm am in awe of the difference it makes to 'block your finished product'. It's beautiful and as always reflects your attention to detail. This is absolutely gorgeous! The colours are just great together and I love how you chose the red to go with one of the recipient's favourite colours. 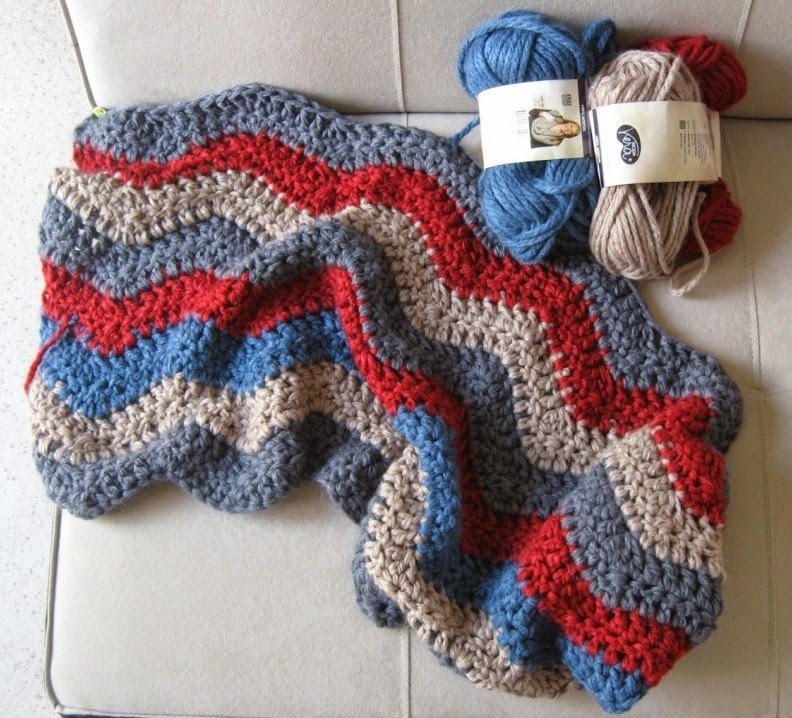 I also love projects which grow very quickly-I am going to check this pattern out. I'm sure the receiver of this lovely gift will be thrilled with it! Thank you everyone for your friendly comments. Please excuse me for being late with replies - tech failure = no internet for a couple of days - but all fixed now. The ripple blanket was well-received and has been in daily use ever since. It has been a talking point for visitors and helpful to 'break the ice' with new hospital staff. I am so glad that the blanket is a success although I am very sad about my relative being so ill in hospital. I've had little time for blogging in between crocheting this blanket, extra errands and hospital visiting. Please be patient if my posts are not published as regularly as usual. I remember what it was like when first diagnosed and it can be overwhelming, scary, confusing and rather isolating too. I'm happy to be here as a helping hand. Eliminating caffeine is useful. I did it as part of a pain management strategy - I want to reduce my nervous system's sensitivity to pain and other stimuli. By avoiding stimulants like caffeine, my nerves get a chance to settle down and the body doesn't have the stress of highs and 'crashes'. Ultra violet light (sunlight) is a common trigger for many lupus sufferers. Exposure to sunlight and other sources of UV (such as some fluorescent tubes and some of the energy saving light globes) has a significant impact on my symptoms. The new LED globes are supposed to be much better. Sunscreen is part of my regular routine. I also try to reduce the toxic burden on my immune system by avoiding artificial additives (preservatives, colours, flavourings) in foods, avoiding processed foods as much as possible and sticking to fresh, whole foods and home cooking. If I don't know what's in it, I don't eat it! When in my late teens I cut out margarine and went back to butter and noticed an improvement. Nowadays I have lactose intolerance and don't eat butter but will either go without or substitute other things like olive oil, almond oil, avocado etc. We need 'good fats' in our diet because some nutrients are fat-soluble and only available to the body in their soluble form. I think Vitamin D is one of those. Be mindful of your nutrition - steroid medication can leach the calcium out of your bones so you need to find a way to get enough Vitamin D to metabolise calcium without over exposing yourself to sunlight. It's a tricky balance! Finally, sleep! I need to make a conscious effort to get extra rest in each day. It is easier said than done, believe me, but if you neglect your rest, it will soon catch up with you. The idea is to manage energy to avoid the 'crash and burn' cycle. That takes self-awareness and (for some like me) a lot of practise!